OH YES. I DID. Like many Americans, we celebrated the 4th with friends, food, and fireworks. In coming up with the perfect dessert, I took into consideration the King's definition of a dessert. I decided ice-cream would be good to cool everyone down in the sweltering heat. Then I concluded that one of my favorite flavors of ice-cream is cake batter. After that decision was made, I had to amp up the festive quotient. It had to be red, white, and blue for the occasion. Obvi. It went great with brownies which are also extremely American (*FUN FACT: a cross between cake and a cookie, it became popular in the early twentieth century). 1. Sift the powdered sugar and set it aside. 2. Mix the shortening in a bowl with paddle mixer attachment (or with a handheld mixer) until smooth. 3. Add in vanilla extract. 4. Slowly mix in the sifted powdered sugar until smooth. 5. Add in the whipping cream and mix on medium for a couple minutes. 6. Mix in desired food coloring. 1. Sift the funfetti mix into a small bowl and set aside. 2. In a medium bowl, whisk the milk and sugar until the sugar dissolves. 3. Whisk in the heavy cream and vanilla. 4. Whisk in the sifted funfetti mix until there are no lumps. 5. 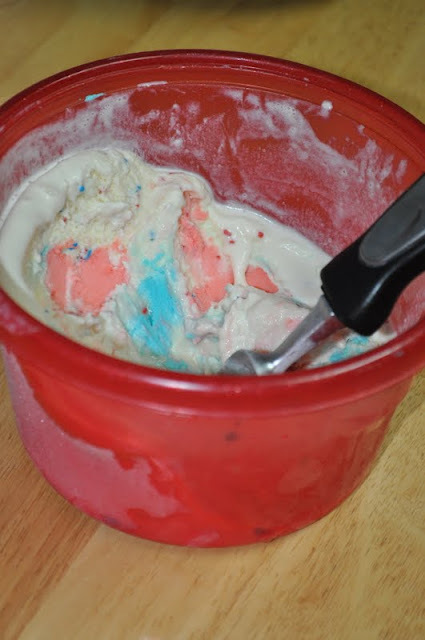 Pour mixture into the freezer bowl of your ice-cream maker and let it mix until thickened (15-20 minutes). During the last minute mix in any desired festive sprinkles. 1. Spread a layer of ice-cream in the bottom of your container. 2. Place dollops of frosting on top and swirl the ice-cream and frosting together. 3. Repeat as many times as possible (I made it 4 times before I ran out of frosting). 4. Freeze for 2 hours to allow ice-cream to harden. MMMMM - my ice cream maker has been hybernating to long....might need to break it out for this....although the Lindseys have been banned from cake batter flavored ice cream since the debacle on our honeymoon.